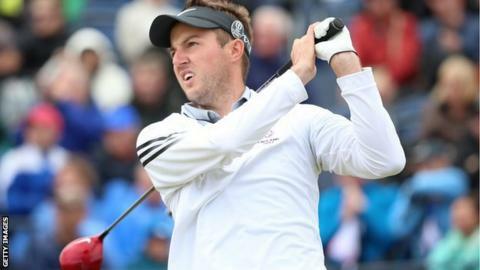 Shropshire's Ashley Chesters was delighted with his final round 69 at St Andrews to finish joint tied for 12th in the 144th Open Championship. But the 25-year-old Hawkstone Park amateur knows his nine-under four-round score might have been even better. "I had an eagle putt to tie me for the lead on the 10th green," Chesters told BBC Radio Shropshire. "How great would that have been to lead The Open on the final day? That's why I hit the putt so hard." Instead, although he made the return putt back for birdie to go to 11 under for the tournament, just one adrift, he got under the face of a bunker on 15 and made double-bogey. His aggregate total of 279 tied him with fellow amateur Oliver Schniederjans on nine under, three shots better off than the joint overnight leader, Irish amateur Paul Dunne. And, although it was not enough to earn him the silver medal, finishing two shots behind American Jordan Niebrugge, Chesters said: "I've played well this week, so I'm really happy." Manchester United season-ticket holder Ashley Chesters is coached by another Shropshire player, former European Tour professional Michael Welch, who once beat Lee Westwood in the final to become the World Boys' champion.Chesters' mother and father, Gina and Nigel - who was friends with 1985 Open champion Sandy Lyle in their junior days together at Hawkstone Park - spent the same year in office as men's and ladies' club captains in 2014. Chesters, who will turn professional after the Walker Cup in September, carded five birdies in 11 holes - and could even have gone higher on the leaderboard. He made birdies at the second, third, sixth and ninth to go out in 32 strokes, and added another at the 10th to move within two shots of the lead on 11 under. But, after four straight pars, his hopes vanished with that double-bogey six at 15. Having been partnered by fellow Midlander Andy Sullivan in his first three rounds, Chesters was separated from his former amateur team-mate and rival on the final day. While Chesters played with Greg Chalmers, Sullivan was also paired with another Australian - Marcus Fraser. Sullivan, from Nuneaton, made an amazing start to the final round of his first Open, making birdies on his first four holes. He even recovered from the shock of a double-bogey seven at the long fifth by getting back to four under for his round with two more birdies at the seventh and 10th holes. But he then ran up another seven on the Old Course's other par five, at 14, dropped another shot at 15 and signed for a 71, finishing six-under for the Championship in a share of 30th place.